Site Name: No. 37 PENDRE. 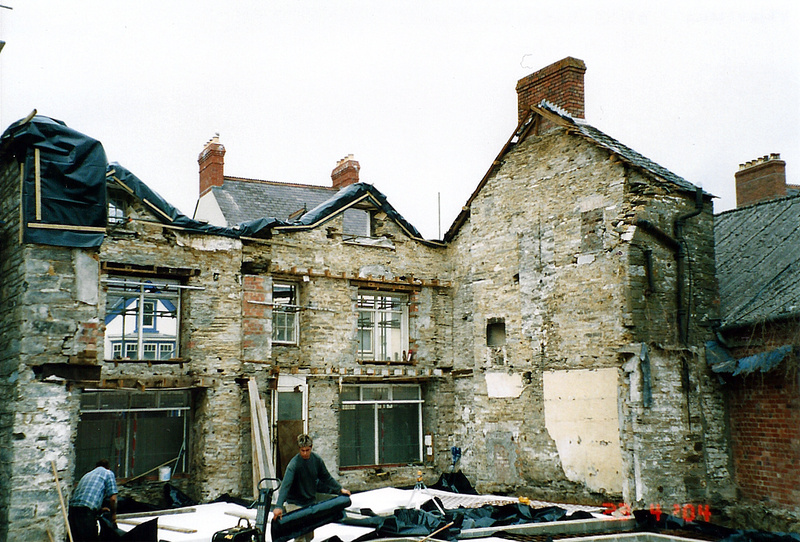 On 10th December 1840 Philip John Miles of the Priory leased the site to Evan Evans, Governor of the Cardigan County Gaol, for 99 years at £2 per annum, who demolished the pair of old cottages which formerly stood here and built the present building and No. 38 Pendre. In 1851 the following persons lived here: Evan Evans, 70, former Governor of Cardigan Gaol; Mary Evans, 71, his wife; and Hannah Jones, 23, house & farm servant. On March 9th 1852 Evan Evans died aged 71. In 1861 this was the home of the following persons: Mary Evans, 81, widow of Evan Evans, former Governor of the Cardigan County Gaol; Margaret Thomas, 42, her daughter, dress-maker; Mary Thomas, 11, grand-daughter; Evan Thomas, 10, grandson; Margaret Thomas, 10, grand-daughter; and James Thomas, 7, grandson. On 9th February 1865 Mary Evans, widow of Evan Evans, died aged 86. On October 13th 1868 Mary Anne Evans, wife of Evan Evans jnr, Cardigan Gaol governor, died aged 41. Evan Evans jnr., Governor of Cardigan Gaol, died on February 28th 1870 aged 45. In 1871 Mrs. Margaretta Thomas, 52, widow, lived here. No. 37 is marked on the 1887 O. S. map. In 1891 the following persons lived here: John James, 29, butcher; Mary Hannah James, 27, his wife; and William Morgan James, 10 months, their son. In 1891-1900 John James had a butcher’s shop here. On 3rd December 1894 a daughter was born here to Mrs. & Mr. John James, butcher. In April 1895 and September 1896 No. 37 was advertised to let. In 1901 the following persons lived here: Margaret Williams, 42, confectioner & shopkeeper; David Gwilym Williams, 17, her son, engine fitter’s apprentice; Mary Elizabeth Williams, 14, daughter; and John Huw Williams, 7, son (b. St. Dogmaels). All were born in Holywell and were bilingual except where noted otherwise. In 1901-14 Margaret Williams lived here and kept a grocer’s shop. In 1911 the following persons lived here: Margaret Williams, 52, widow, confectioner; Mary Eliza Williams, 24, her daughter; and John Huw Williams, 19, son. On 8th December 1911 David Gwilym Williams, son of Mrs. Margaret Williams of No. 37 and the late Hugh Roger Williams – former Master of the Cardigan Union Workhouse, St. Dogmaels, married Miss Martha Ann Evans of No. 26 Quay Street. By 21st March 1919 Margaret Williams had died. In July 1919 the former confectioner’s shop of the late Margaret Williams was advertised for sale. 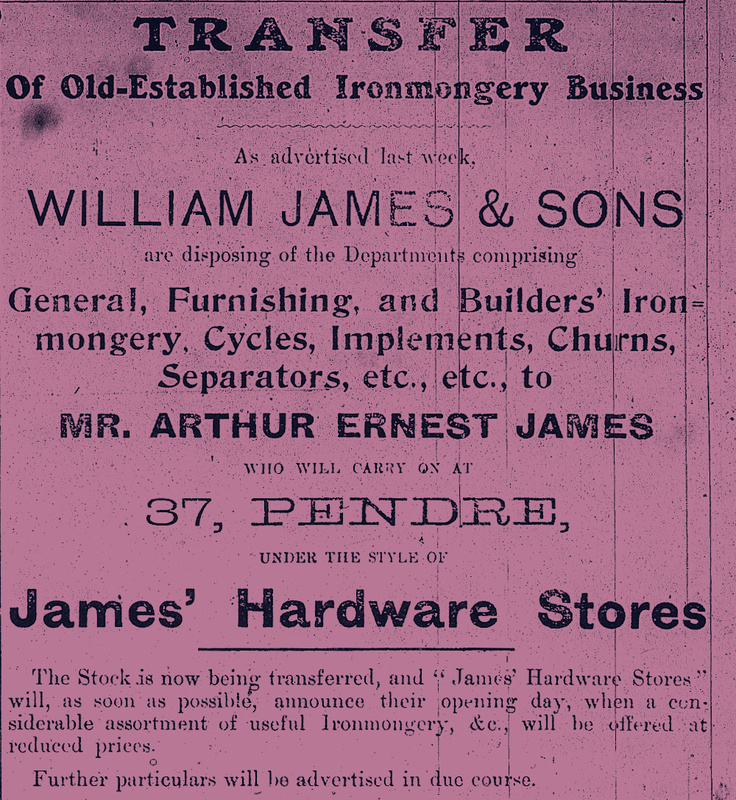 On 8th November 1919 Arthur Ernest James opened his ironmonger’s shop here – William James & Son of Gwalia House had transferred their ironmongery department here. In 1919-27 Arthur Ernest James, ironmonger, had a hardware shop here. In January 1927 A. E. James announced that he was transferring his business to his former assistants – George Martell Evans and Arthur M. Morris. The shop re-opened on 5th February 1927 under their management. On 24th April 1936 ‘Peacock’s’ opened here. In 1936-62 No. 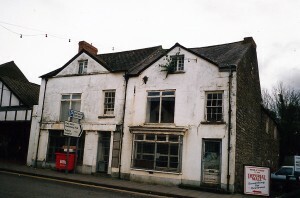 37/38 Pendre was a branch of ‘Peacock’s’ clothes shop. On June 29th 1939 Annie Dorothy Sneade of No. 37, 22, daughter of labourer Albert Sneade, married James Lewis Stephens of Alltfach, St. Dogmaels. In September 1946 Mr. S. Powell resigned as manager and went to manage S. T. Jones’ store at Shire Hall, High Street. In October 1964 No. 37 was advertised for sale. By 1969 this was part of the premises of Harries & Harries, auctioneers. No. 37 was then derelict for many years. It was sold in March 2003. In April 2004 the rear range was demolished and most of the front range followed. Rebuilding was well under way by September and completed in November. In early 2005 Antur Teifi moved their offices here. Advertisement – Harries & Harries, 38 & 39 Pendre 1969. Site Name: No. 38 PENDRE. On 10th December 1840 the cottage here was leased by Philip John Miles, owner of the Priory estate to Evan Evans, Governor of the Cardigan County Gaol, for 99 years at £2 per annum. Evan Evans rebuilt Nos. 37 & 38 Pendre. On 13th February 1850 Margaret Mathias, daughter of John & Maria Mathias of No. 38, died aged 15 months. In 1851-60 John Mathias lived here. In 1851 the following persons lived here: John Mathias, 34, cabinet maker; Maria Mathias, 34, his wife (daughter of Gaoler Evan Evans, married 08/11/38); Mary Mathias, 12, their daughter, scholar; John Mathias, 10, son, scholar; Evan Mathias, 8, son, scholar; David Mathias, 6, son, scholar; Thomas Mathias, 4, son, scholar; and Richard Mathias, 4 months, son. On 16th September 1853 Richard Mathias, son of John & Maria Mathias, died aged 3. In 1857 Edward Mathias was born here. On 10th April 1860 John Mathias died aged 44 and was buried at St. Mary’s Church on 13th. In 1860-71 Maria Mathias & Sons, cabinet-makers, occupied No. 38. On 24th January 1861 Mary Mathias, daughter of the late cabinet-maker John Mathias, married William Charles Wilson, cabinet-maker, St. Mary Street. In 1861-1923 William Charles Wilson, cabinet-maker, and family lived and traded here. In 1861 the following persons lived here: Maria Mathias, 44, cabinet-maker’s widow; Mary Wilson, 21, her daughter; William Charles Wilson, 20, son-in-law; Evan Mathias, 18, son; David Mathias, 15, son; Thomas Mathias, 14, son; Richard Mathias, 6, son; Edward Mathias, 4, son; and Maria E. Wilson, 1, grand-daughter. On 4th January 1864 Evan Mathias, cabinet-maker, son of the late cabinet-maker John Mathias, married Margaret Griffiths of Llangoedmor. In 1871 the following persons lived here: Maria Mathias, 54, widow; Richard Mathias, 16, her son, cabinet-maker; Edward Mathias, 14, son; and a servant. In 1873 William Henry Wilson was born here. By 27th October 1876 Messrs. Morris & Wilson, builders & contractors, traded here. By 26th January 1877 they had built a new china & glass warehouse at Pendre. On 15th June 1877 a daughter was born to Mr. & Mrs. William Charles Wilson. On 3rd December 1877 Margaret Caroline Wilson was buried at St. Mary’s Church, having died on 29th November 1877, aged 3. In 1878 Elizabeth Ann Wilson was born here. In 1881 the following persons lived here: William Charles Wilson, 40, cabinet-maker; Mary Wilson, 41, his wife; Maria Elizabeth Wilson, 17, their daughter; Mary Hannah Wilson, 20, daughter; John Wilson, 14, son; James Wilson, 12, son; Evan Wilson, 11, son; William Henry Wilson, 8, son; and Elizabeth Ann Wilson, 3, daughter. In 1883-84 the following persons lived here – W. C. Wilson, Mrs. Wilson, Maria Wilson, M. A. Wilson, and John Wilson. No. 38 can be seen on the 1887 O. S. map. On 13th January 1889 John Wilson, 22, cabinet-maker, married Anne James, 22, of Castle Street. In 1891 the following persons lived here: William Charles Wilson, 50, cabinet-maker; Mary Wilson, 57, his wife; Maria E. Wilson, 29, their daughter; James Wilson, 22, son; Evan E. Wilson, 21, son; William Henry Wilson, 18, son; and Elizabeth Ann Wilson, 13, daughter. On 2nd April 1893 Evan E. Wilson, 3rd son of W. C. Wilson of No. 38, married Miss Eleanor Jane Davies of the ‘Royal Oak’, Quay Street. In June 1893 W. C. Wilson announced that he was taking over J. R. Daniel’s premises at No. 12 St. Mary Street. In January 1894 W. C. Wilson’s opened another shop at No. 12 St. Mary Street. In 1901 the following persons lived here: William Charles Wilson, 60, cabinet-maker (b. Troedyraur); Mary Wilson, 61, his wife; William Henry Wilson, 28, their son, cabinet-maker; Lizzie Anne Wilson, 23, daughter, dress-maker; and William M. James, 10, grandson. Except where noted otherwise, all were bilingual and born in Cardigan. On 31st December 1901 William Henry Wilson, youngest son of W. C. Wilson, married Miss Martha Jane Griffiths of St. Dogmaels. In 1911 the following persons lived here: William C. Wilson, 70, cabinet-maker; Mary Wilson, 71, his wife; and Lizzie Ann Wilson, 32, their daughter. On 23rd October 1918 Mrs. Mary Wilson, wife of W. C. Wilson, cabinet-maker, died aged 79. In July 1919 No. 38 was advertised for sale. On 23rd February 1923 William Charles Wilson of No 38 died aged 82. In April 1923 No. 38 was advertised for sale. 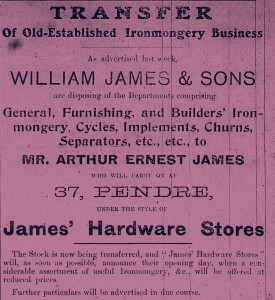 In 1923 A. E. James’ Hardware Stores was located at Nos. 37/38 Pendre. On 24th April 1936 ‘Peacock’s’ opened here. In 1936-62 Nos. 37/38 were a branch of ‘Peacock’s’. In September 1946 manager Mr. S. Powell left to become manager of S. T. Jones’ store at Shire Hall, High Street. ‘Peacock’s’ closed in 1962. In October 1964 No. 38 was advertised for sale. By 1969 this was part of the premises of Harries & Harries, estate agents & auctioneers. Long derelict, No. 38 was sold in March 2003 to builder Phil Evans. In April 2004 the rear range was demolished as was most of the building soon afterwards. Rebuilding was well under way by September and completed in November. Early in January 2005 Antur Teifi moved their offices here, which were declared open by the Mayor, Cllr. Linda Grace on 26th January 2005.